Lately the Philippines has been lucky enough to have had quite a number of new restaurants and new finds to brag about, and soon Manila will be one of the world's culinary city. And as much restos have opened, there also came about the opening of many drink places, not the ones with alcohol that is. There is a new place in town, and yes they hot and cold drinks, from the most common fruit concoctions to the most outrageous ones using cheese and salt. Let me share this experience with you as we embark on this wonderful drink fest. Yes you read it right Coffee with Rock Salt and Cheese Flavor (P100 - large), outrageous right? But my companions seem to say it's ok, I cannot comment on the taste of this but my friends says it's something new and different, have to sip it with straw. Try this one for a change. This was what I had, Blueberry concoction (P90). As the staff has recommended, this is definitely for the kids. It has a mix of sweet and citrus flavors kids surely will love, they also have the Passion fruit blend which I'm sure the kids will love as well. Mixed it up let the flavor loose. I enjoyed it like a kid haha, I'll be back for this soon. 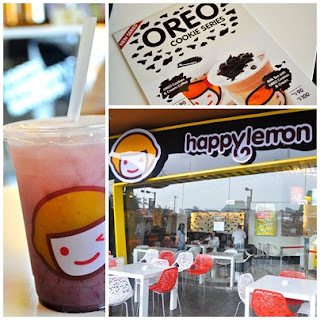 Happy Lemon is indeed a happy place, it is very relaxing and the bright colors are just nice to chat things away with friends, a new hang out place for friends and family to enjoy delicious drinks. They will soon also launch their food line up, expect for those soon.